Sailing across the coastline, leaving behind us Milos bay, we pass by the traditional fishing villages of Skinopi, Klima, Areti and Fourkovouni with the impressive colorful little houses which called “Sirmata”. Then we will enjoy Arkoudes, a complex of lava rocks, which takes its name by its characteristic shape, the form of a bear. We open the sails for the stunning Vani cape. It is an old manganese mine with really breathtaking rocks! 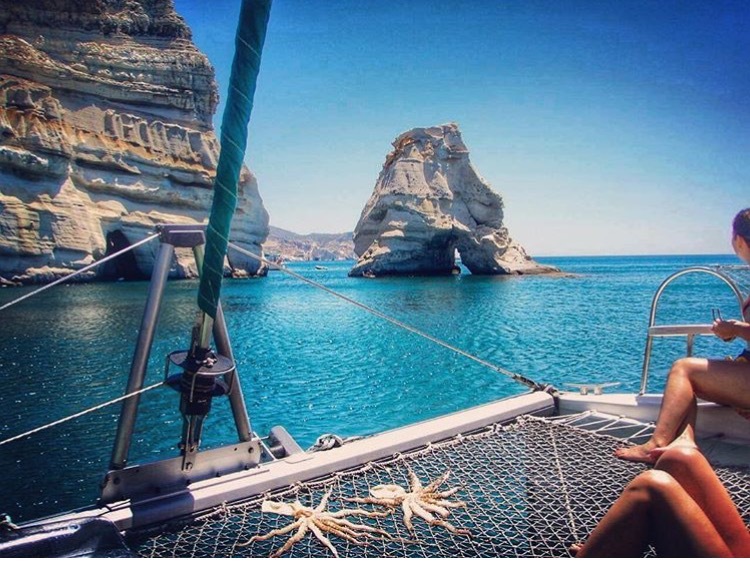 Now, we are sailing at the west coastline of Milos, we are going to see the beautiful beaches of Kalogries, Agathia, Triades, Amoudaraki and Agios Ioannis. During our cruise you will admire the impressive rocky formations of the volcanic lava, until we arrive to the unique sea cave of Milos which is called Sykia! There you will enjoy your first swim of the day in the transparent waters. Using the snorkeling equipment we will swim to the beach. Α delicious fruit salad will be waiting for you onboard! We continue to sail along the west part of Milos heading to Kleftiko, the famous old pirate bay! 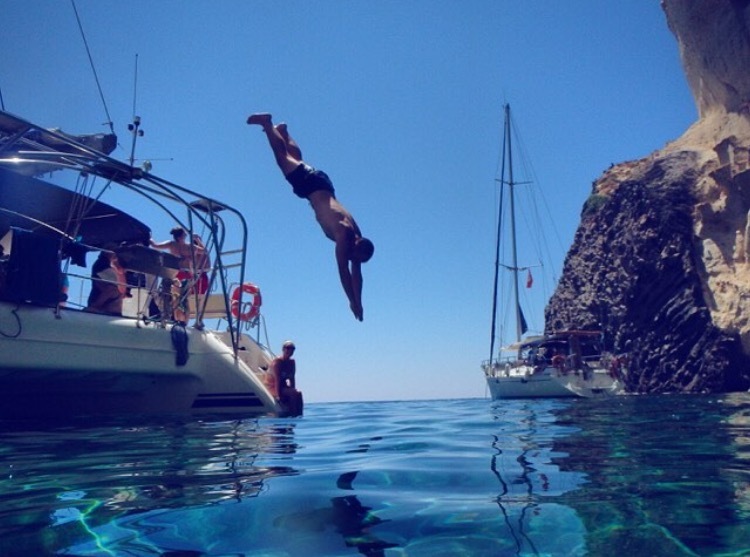 There you will enjoy the majestic sea, you will explore the numerous sea caves and you will take underwater photos! Afterwards, it is your time to relax on the catamaran, where delicious little snacks will be served! 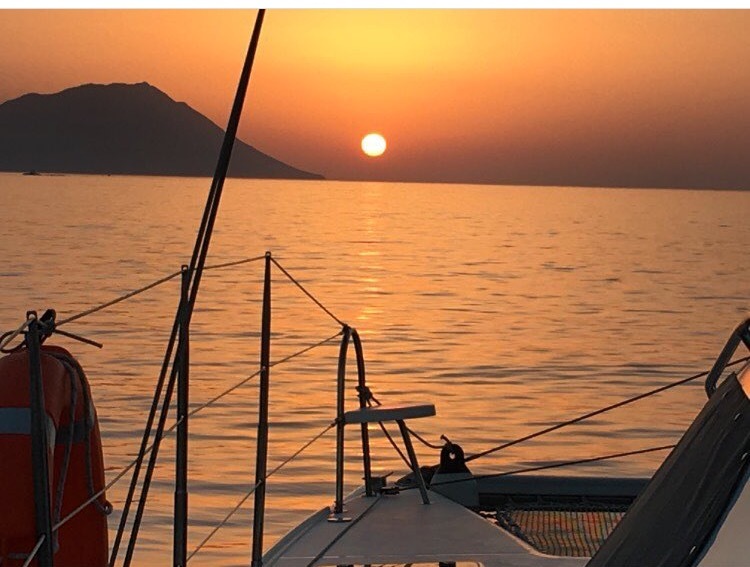 As we are sailing the south part of the island, you will see the beautiful beaches of Gerontas and Psathadika, before we arrive at the moorage ofProvatas, one of the most picturesque locations of the island, where your disembarkation will take place.